Now that you are flying out of this area, you will encounter more Griffins that you will need to kill. These Griffins are a bit tougher and have riders on them that will also attack. Towards the end of this phase, there is a “Boss" griffin that you need to pass. This one will have a series of animated button sequences. If done incorrectly, you will have to try and defeat him again. Once past him, Kratos gets knocked off Pegasus. An animated sequence appears and you will need to press the appropriate buttons. If you fail, you will need to do this again. When you do it right, you will land on a wall area. Nearby is a saving point. Save your game. Nearby the saving point is a ladder. Go up and you will reach an area where you will need to climb above on an overhead ledge. Continue until you reach an edge where you can climb on top of the cliff ledge. Here you will encounter some more enemies. Depending on the level of difficulty you are playing, they may be a bit tough. Consistent with other enemy attacks, if enough damage is done, you may see the circle button appear and you can do a final killing blow. After you clear out this area, go to your right and climb up the ladder. Here you will reach a large area with some vicious dogs. Kill them off. On your left is a lever. You will need to activate it to go to the area below. But before you do that, notice that there are several skeletons hanging above you (there are also a couple red and green orb chests nearby). Use the Blades of Chaos to chop at them. You will receive red orbs. However, one of them is not a skeleton, but a corpse instead. Once you knock it down, pick it up (R1) and drag it to the platform on the left with the lever. Activate the lever with R1 and go down below. When you reach this section of the God of War 2 guide you will see a locked door, a pressure stone and a lever. Pick up the corpse and place him on the pressure stone. This will open up the door in front of you. Now activate the lever (R1) and drag it towards the pressure stone using the analog stick. This will cause a second door (behind the first one) to open. Once you fully open the door, quickly run through to get to the next room. This next room appears barren except what looks like a large wooden wall. This is actually a drawbridge. Have Kratos knock it down to see a wide open area where you can see an island and the large stone “Steeds of Time". An animated sequence appears where Gaia talks to you about Zeus past and some other interesting information. You need to find your way to this island. To the right of you on this platform is a narrow pathway. You will need to quickly get across this area as it begins to fall apart as soon as you start walking on it. Nearby is a ledge that you can climb up and over to the other side. Now you will encounter a Cerberus “boss" and several dogs. In order to kill the Cerberus, you will need to chop off all three of his heads. Try to eliminate the small dogs to get them out of your way first. Use your rage attack to inflict large amounts of damage. When he gets stunned you can then press the circle button to do a final killing move that will take off one of his heads. Once he is defeated you will need to get out of this room. There is a ledge to the left side that you will need to get to. Unfortunately, you cannot just jump up there. Look around the room for some statues. Chop at them to release a chunk of the wall. Drag it over to the left side and jump on top of it and up to the room above. 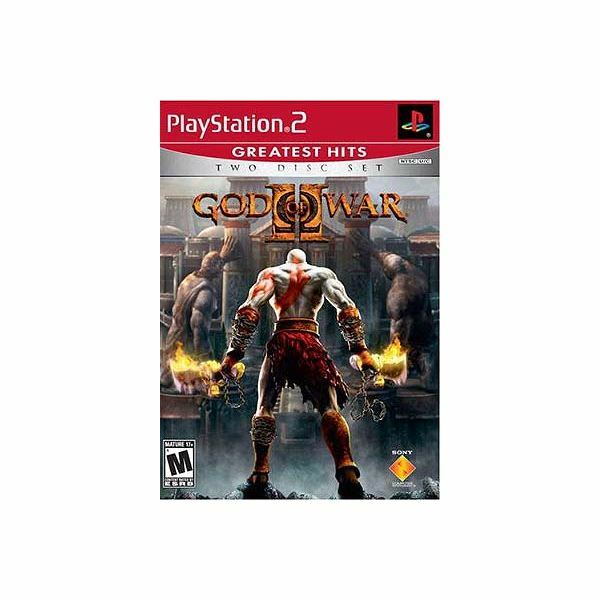 Go to the next page to continue with this God of War 2 guide. In this room are some more dogs and a saving point. Once the room is clear, save your game. Look at the side of the room that faces the outdoors and cliff area. There is a narrow pathway that you can take out of this room (you may not spot it at first). Be careful, as you can fall. At the end of this you can climb down the wall to another room that has some orb chests and a ladder. Climb up the ladder to the “ceiling". You will need to move along this area until you get to the edge of it located outside. In the middle of this you will encounter some enemies and a small barrier that Kratos needs to hack through. When you reach the edge, look for a spot that you can climb up to a platform above. If you have followed this God of War 2 guide this far, you will see more dogs and undead archers in the distance. Use Typhon’s Bane to eliminate the archers first. Once the area is clear, walk towards the large door in front of you. Unfortunately, it is locked. Look to your left, there is a narrow pathway to where the archers were located. Jump across the small gap to the other side. It may not seem like you can, but it is possible. You may be tempted to do a fast double jump (X button twice). Instead, press the X button once, pause for a brief moment then press X again. You should then reach the other side by hanging on its edge. Climb up to into the next area. In this area are more dogs and undead soldiers to eliminate. Do what you need to do then go to the end of the room where you see a lever. Take this down to another room that appears empty. It is not. When you walk in, the room closes off locking your way out. You will encounter Sirens who scream and try to kill you. They can stun you, and if this happens move your analog stick left and right until you can move again. Killing them causes them to explode and knock off some of the barrier that is blocking your way out. You will need to eliminate a few them before you can get out. Once out of this room you will see a saving point and a blue orb chest. Save your game. By this point in the God of War 2 walk through you should now see the “Steeds of Time". You will need them to help you get to the island. Carefully walk across the large chain path towards these horses. At the end of this climb up to the wall nearby to the platform above. This platform has a lever on it that will release a chain rope pathway that Kratos can hang onto and slide down to another area. In this area is also a locked door that you will need to go back to. Once you activate the lever, quickly move to the chain or you will need to go back and activate it again. Get across and you will run into another “boss" fight. This guy seems to know you, and is guarding the pathway to reach the Sisters of Fate. You will need to kill him off in order to get the “Horse Keeper’s Key that will unlock doors and other items. This guy is tough. He has a spear that emits a magic blast that he can fire at you as well as a ground attack that causes spikes and other enemies to appear. He blocks really well. 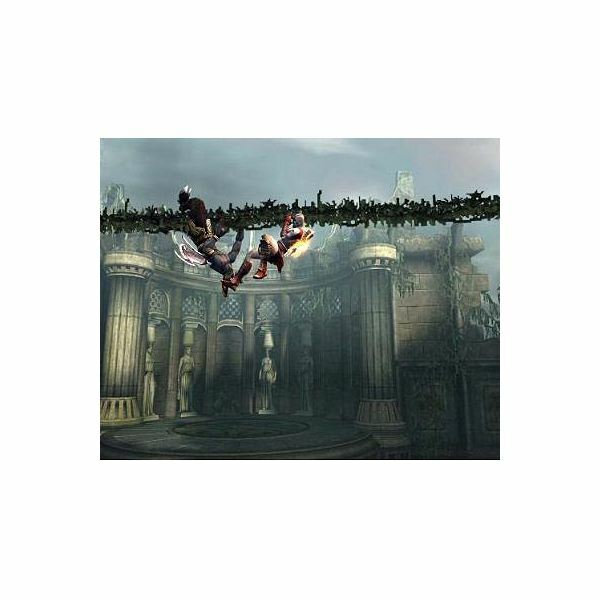 Use Typhon’s Bane when he jumps to an area above you (that you cannot reach). Once you do enough damage, the circle button will appear. He will appear to be hanging down from the above platform. You will need to jump and then press the circle button, or he will get un-stunned (and you will need to fight him again). After you kill him off, you will take the Horse Keeper’s Key from him. This will open the door in front of you as well as the other one on the other platform you just came from. Inside this room are some blue orb chests. If you have reached this point in the God of War 2 walk through, you will need to go out the side doorway that leads to a ladder. This will take you up to a platform where you can take a chain rope back to the area with the other locked door. Once you open the other locked door you will see a podium inside. Use the Horse Keeper’s key and Kronos will appear. 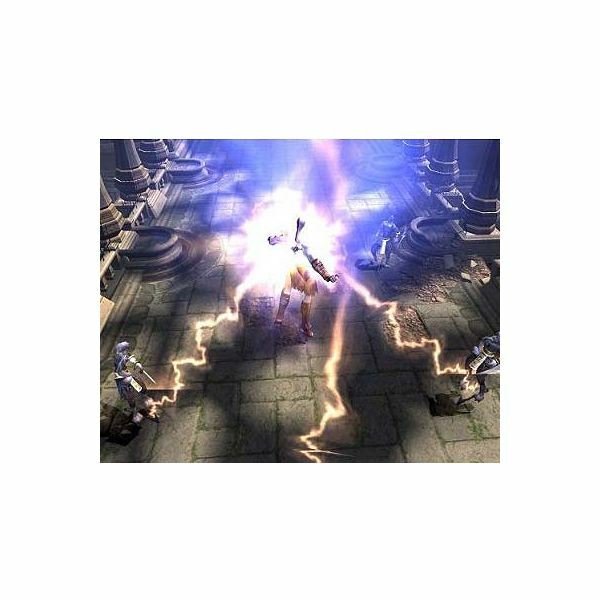 Kronos gives you the last of his remaining power, which gives you the “Krono’s Rage" ability. After this Kronos disappears and enemies appear. Use this opportunity to try out the Krono’s Rage and kill them. When the area is clear, you will be able to exit through a door to your left. Go up the ladder. This leads to a pathway towards one of the horse’s heads. Walk forwards to another platform that has four colored switches (red, green, yellow, blue). You will need to activate these switches and use the Horse Keeper’s Key in order to activate the Steeds of Time. First, activate the red lever. Quickly go to the path to your right until you reach a wall you can climb. Flying creatures will try and attack you. It is crucial that you get to the top of this wall as fast as possible since the lever will close the spot where you need to use the Horse Keeper’s Key (jumping up this wall is very effective). Once at the top of this wall, use the Horse Keeper’s Key to unlock the first steed. Go back to the colored switches and activate the green one. This time head to your left. Quickly jump up the wall and use the Key again. After you do this, go down directly behind you to reach a chest with a Gorgon’s Eye. Climb back to the colored switches and activate the yellow one. Go back to the left past where you unlocked the last steed. You will see a flying creature that has grappling point (it looks like a white flashing spot). Press R1 to get up to this and swing over to the other side. Use the Horse Keepers key in the appropriate spot nearby and go back to the colored levers. Now activate the blue switch. Go to the right, going quickly past the spot where you unlocked the first steed. Again, you will need to swing across by jumping up (and pressing R1). Quickly climb/jump up the oversized steps to reach the spot where you need to release the last steed. Head back to the colored switches and begin activating the Steeds of Time by pressing R1 in the center of this platform (it will look like a white spot). This moves the platform back in between the horses. An animated sequence appears where you will need to use the analog stick left, right and circular, which whips the horses into motion. When done correctly, another animated sequence will appear and the horses will drag the land formation they are attached to close to the island where the Sister’s of Fate reside. Once the horses stop moving, Kratos can go back to a platform area where there is a saving point. Save the game. You have now successfully activated the Steeds of Time and completed this God of War 2 walk through. Screenshot images created by Sheila Robinson.